The sun was out and the sky was painted a bright clear blue. 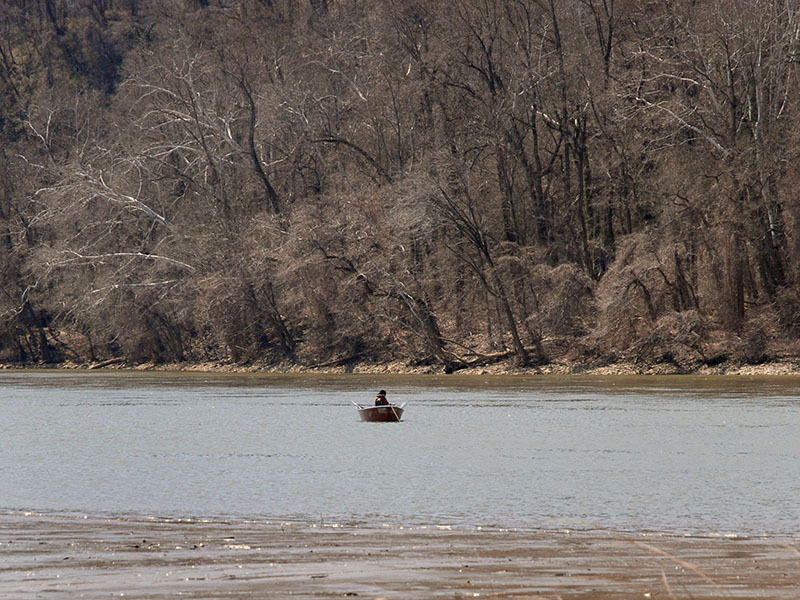 But the temperature was pushing the low 30s and with a nasty wind blowing down the Potomac River outside Fletcher’s Cove in Washington, D.C., it made for very miserable fishing as I tried to hook my first Hickory Shad of the year. It wasn’t like I didn’t know it might be bad. I knew it was going to be cold and was wearing layers plus waders and a fleece jacket and thermal cap. Normally, for this time of the year, that would be more than enough to be comfortable on the water but it would turn out to be not quite enough and I would pay for it. Alex at the concession stand warned me it would be cold out there as I signed out a Fletcher’s rowboat. He said they caught two fish the other day so that information got me a bit pumped up. As I loaded the boat I saw that there were three other people on the water, spread from just outside the cove down to Walker’s Point. The tide was heading out and I just managed to make it out of the cove before it got too shallow. 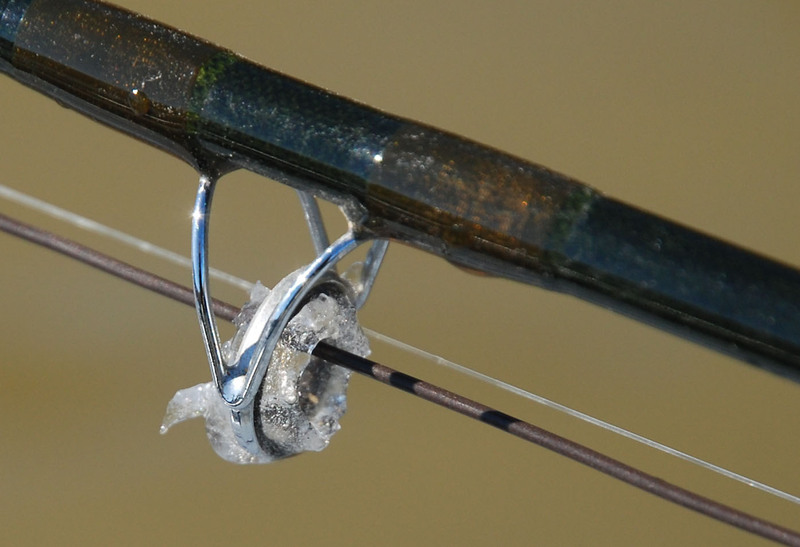 I dropped the rock well inside the main current seam and began fishing a 7 weight rod outfitted with an Orvis Depth Charge density-compensated full sink line. The water was colored light brown and as I fished I began to feel the effects of the wind as it howled down the river. It wasn’t bad at first--felt a bit cold but it was tolerable. I used a variety of flies in a number of sizes featuring the popular colors that worked last year. I started shallow, thinking the fish would be up shallow due to the water color, then gradually dropping through the water column until I was dredging bottom. I got one tentative bite that was on and off in a matter of seconds. I never saw the fish, and it could have been one of many of the species that inhabit this part of the Potomac River, but it felt like a Hickory so I’m claiming it was a Hickory. At least that makes me feel better about the rest of the day. With no bites in the shallower water I lifted the rock and moved out to a spot just outside the bubble line of the main current. The water here was much deeper, still colored with debris mixed in, and flowing fast. As I fished, the wind began to really pick up and I was beginning to feel the effects of the cold. How cold was it? Cold enough that I had to break ice out of the rod guides. Cold enough that as I stripped line in, a fine coating of ice, like the frost you scrape off from your windshield on a really frigid day, was flaking off the incoming line and onto my hands. Cold enough that the tips of my fingers wet going numb and my hands were a bright red color even thought they were protected by fleece gloves. Cold enough that the chill was knifing right through the down jacket, waders and layers and I was beginning to shiver. And still no bites. A couple of the other boats headed in for the day and a lone Cormorant paddled past, giving me the nasty eyeball. I pulled the rock and moved down towards Walkers Point to fish but still drew a blank. As I lifted the rock again to move to a new position I was blasted by a huge gust of wind that almost blew my rod over the side. That was it. I decided to wimp out and called it a day. A word of warning--the entrance to Fletcher’s Cove is a very narrow ramp that can accommodate only ONE car at a time so be very careful. It is also very easy to drive past the Abner Cloud House, so be alert. And it is REALLY difficult to negotiate this ramp if you approach Fletcher’s Cove via Chain Bridge because the entry ramp faces Key Bridge. There is NO RAMP facing Chain Bridge. Park in the upper lot on your left or go through the tiny tunnel (if you have anything on roof racks, I suggest checking the tunnel height BEFORE entering) to the lower parking lot and dock access.